Last year, on a quiet afternoon, alone in my bathroom, I mixed a few ingredients in a simple glass bowl: cocoa powder, arrowroot, clay, and a dash of spice. The creation of my very first DIY, homemade foundation powder. Hesitantly, I dipped my finger in the powder and applied it to my face. I studied the mirror, inspecting my creation. Homemade make-up worked. It was a glorious moment. An addictive moment. An epiphany. Since that quiet afternoon, I’ve been on a DIY kick. A mission to oust the chemicals and replace them with simple homemade products that actually work. Body wash? I got that. Boo-boo cream for ouchies? 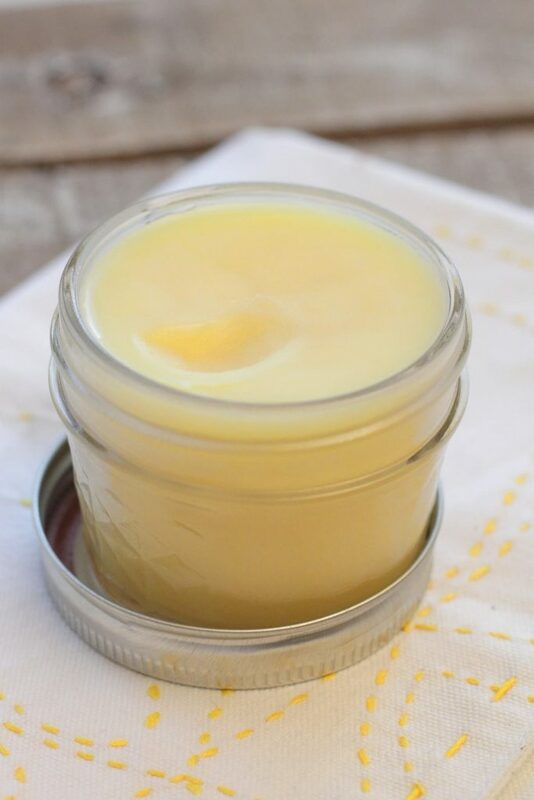 Homemade salve to the rescue. Laundry Soap? Absolutely. Move aside Tide. Last week, Piper started to get the sniffles. Sniffles led to congestion and no sleep. A couple of nights later, congestion struck again, this time it was my turn. Immediately, knowing a very rare cold was coming for our family, I made a batch of homemade elderberry syrup. While the elderberry syrup, broth, and probiotics went to work cold-busting, congestion relief and a good night’s sleep were needed. Time for a new DIY? Colds always evoke memories of my mom with a little blue bottle. The smell that radiated from that bottle was like no other. The sweet relief it brought to my congested nose and chest was always welcome. My mom would gently rub the moist balm under my congested nose, back, and chest. Anytime I feel congestion coming on, my mind always goes to that blue bottle and my mom’s TLC. With the memory of my mom’s healing touch and a love for DIY, this recipe was born in our time of need. A combination of simple, natural ingredients coming together to provide a relief for chest and head congestion. The warm touch and scent of this homemade rub is not only calming, but also contains antiviral and anti-bacterial properties. A vapor rub that’s natural and effective. Note: I didn’t use this rub on our kids, just the adults, since rosemary, eucalyptus, and peppermint aren’t considered “kid-safe” essential oils for young children. Here’s a handy post about kid ages and essential oil use. Personally, as my son has gotten older (elementary school), we’ve used a small amount on the bottom of his feet with socks, when congestion strikes. A combination of simple, natural ingredients coming together to provide a relief for chest and head congestion. The warm touch and scent of this homemade rub is not only calming, but also contains antiviral and anti-bacterial properties. A vapor rub that’s natural and effective. Carefully remove the bowl from the heat. Allow the mixture to sit in the saucepan for 5 minutes. This will allow the mixture to cool so the oils aren't damaged. Pour the mixture into a glass jar. I use a mason jar. This recipe will make one 4 oz. jar of vapor rub. As the mixture cools the liquid will solidify, making it a creamy, spreadable rub. As always, please do your own research when it comes to using essential oils, particularly on young children. Using eucalyptus on young children may slow respiration in some children. Also, peppermint and rosemary essential oil aren't recommended for young children. Here's a handy post (as mentioned above) about kid ages and essential oil use. Found this on Pinterest and going to pin on my Au Natural board. I love Vicks but have been looking for an alternative. I will give this a try. I have used Vicks on sore muscles also. Do you think this would work for that also? Can’t wait! Trying to clean out my cupboard of the store bought stuff too. Hey Erika, I think this would work very well for muscle-pain relief too. I may add a bit more peppermint to the mixture (a couple drops) if using for sore muscles. Enjoy! Also let ppl know they may want a separate “special pot” for their concoctions. 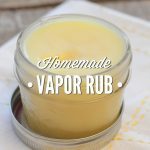 Hi, I have a small, very small, business that helps me support my family and I was wondering if I could use your recipe to sell a homemade vapor rub. I think it’s a great and easy recipe but if your not okay with me selling the product I can find another. Thank you. Hey Jill, I think it would be best to develop your own recipe if you’re selling the product. Bloggers, including myself, work hard to develop our recipes and the little we earn from blogging helps us support our families while doing what we love. I’d love to hear what you come up with. While I agree that you shouldn’t use other recipes, for selling, this is a failrly common recipe. 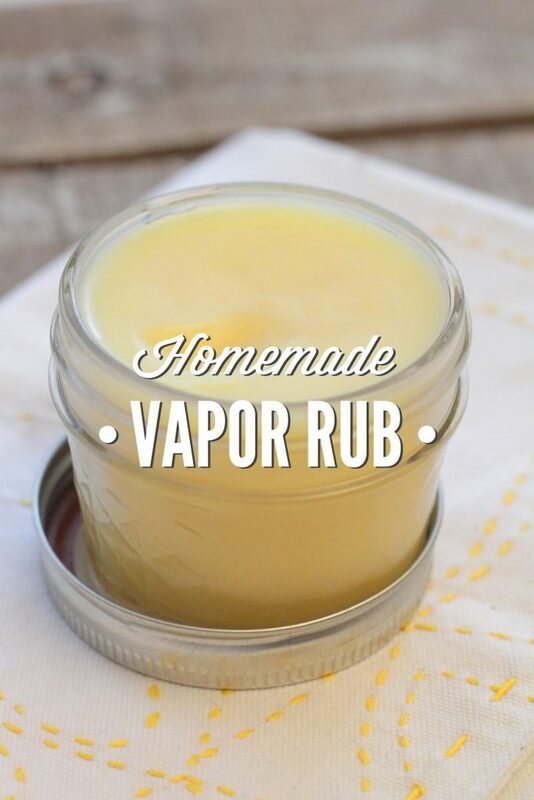 Almost all homemade vapo rubs have the same ingredients. The addition of tea tree oil is the only difference that I see. The carrier oils could be interchanged but, a vapo rub is a vapo rub because of the essential oils used. I have been making your recipe well before I knew it was your recipe. I am not trying to be rude just making an observation. Please correct me if I’m wrong. Hey Lisa, I’m glad you enjoy making vapor rub. I’m not quite sure about your question (or what it is), but I’m glad you’re making and using a vapor rub you love. Thanks for sharing. I’m so grateful for your website. I just made some DIY lip balm for my family. I want to make my own rub since I have a cold but I only have Shea butter in hand. Can I use that instead of cocoa butter? Thank you! Hey Elle, I’m so glad you’re enjoying the recipes. Yes, I believe shea butter will work great. The final product may be a little soft, but should still work well. Great idea, Nicole! Thank you :). I’m glad you’re enjoying it, Monical! I thought about pouring this into a empty deodorant container and that way you can roll up the amount you need and not get your fingers greasy and smelly from the rub. Haven’t tried it but thinking of doing it, what do you think? Leann, That’s absolutely brilliant! I’m going to try that next time I make a batch. Essential oils don’t last as long in plastic, but for a short-term use (a few months) a deodorant container would be perfect! Great idea, Gena! Thank you for sharing! Hey April, Shea butter would work perfectly! What can you use as a substitute for coconut oil? Hey Brandy, You could use olive oil or even add more cocoa butter to replace the coconut oil. I bet, Brandy. So many DIYs call for coconut :(. I was wondering I don’t have rosemary Oil on hand does it change the effectiveness or recipe of I left it out? Also is it safe to use while pregnant? Hey Jenny, The rosemary is an antiviral and antibacterial. It’s also great for respiratory health. You can leave it out and still produce a wonderful vapor rub with the other oils. I’m not sure about pregnancy, as I haven’t been pregnant and used this, but I would consult this site: http://www.learningabouteos.com/. Lea is my go-to source for trusted oil info. Hey Jess, Yes, rosemary and eucalyptus are on the list of oils to be very cautious with around children. For that reason I’m hesitant to recommend anyone using this around a child’s face, however, the feet are generally a safe place to rub this vapor rub. Some kids have had reactions to these oils (slowed breathing) when applied near the face, hence the precautions. My kids do well with both oils so I apply the vapor rub on their back when needed, but first started with their feet and a pair of socks over top. I waited until my children were older before applying to their backs (an older toddler or preschooler) and not a baby. If I wanted to use a different oil other than coconut, would I use the same amount that it calls for? Hey Lynn, yes, you can use the same amount as the recipe calls for. Lovely recipe, I have bought all that i needed to make it. I have one problem though – I couldnt get beeswax in pellets only as sheets, so how many grams (preferably) is 1 1/2 TB of beeswax? Thank you, Louise. I’m not sure how many grams, but I found this site very helpful: http://www.worldwidebeekeeping.com/forum/index.php?topic=567.0. Hope that helps :). Yeah, I looked at that before alse, but in your recipe your 1 1/2TB is in solid form, and the forum site is telling me how to measure the liquid beeswax 🙂 Can you tell me how many TB liquid beeswax goes in this recipe?? And TB means tablespoons right? Hey Louise, No problem. I was away from my computer this afternoon. I’m not sure how many melted tablespoons (TB= tablespoons) I use. I would try 1 tablespoon of melted beeswax, if possible, or grating the block you have. I, too, have fond loving memories of my mom giving me that menthol rub during many a cold and many cases of bronchitis as a child. Every since, I always loved the smell! (I know, many that do not!, though :)) This looks like a great recipe for me to try and have ready for the winter to come. Thank you! And, such a lovely blog! Thank you so much, Lori. Enjoy the homemade vapor rub and sweet memories :). Hey April, The vapor rub shouldn’t be grainy at all, rather very smooth like a hand cream. I’m not sure what went wrong…maybe one of the ingredient brands? Did the cocoa, coconut oil, and beeswax fully melt into a liquid? Or was it grainy? you need to leave it on heat for at least 20 minutes. that will stop the grainy texture. Thank you for the tip, Destiny. The graininess is probably due to the crystalization of the coconut oil. It happens in lip balm all the time. It will still melt far below body temperature, so just rub it on and use it the same way. You can try remelting it, but it doesn’t always help and heat can damage the EO’s, so it’s probably worth just leaving it. Next time, make sure the coconut oil melts at a lower temp, remove it from the heat as soon as it’s melted, and stir as it cools. You could also sub an oil/fat that is less prone to crystallization, like hemp or avocado butter. The graininess comes from the fatty acids in the oils solidifying at different temperatures (each has a different melting point), and has no effect on the quality of the finished product. After you pour your product into its containers, refrigerate them until they are solid and you’ll end up with a velvety smooth texture. Mango butter – I love the stuff. Could I use that instead of cocoa butter? I can’t stand the smell of cocoa butter – even the deodorized stuff. LOL Thanks! Love your blog, and thanks for sharing! Hey Renee, I’ve never personally used mango butter, but I keep hearing great things about it. From what I’ve read, I think it will work great! Is this safe to use in a regular cooking saucepan or do you have a separate you use to make oil concoctions? 🙂 Do you think it would be ok to melt everything in the microwave (glass bowl)? Hey Donielle, I’m not sure about the microwave. If you try melting the ingredients in the microwave I would heat the ingredients in intervals of 30 sec. I use a separate pan for making homemade products only because they can be a bit sticky when cleaning, but you can use any saucepan (even a saucepan you normally cook with). You’re very welcome, Donielle. Enjoy!! I love your website. I made the vapor rub and love it. It has helped my son a lot at night when he gets congested. Thanks!! Thank you so much, Sabrina! I’m so happy to hear the vapor rub is helping your son. Thank you for sharing!! Where should I store the vaporub? Fridge? Just made some. Thanks! Hey Mindi, You can store the vapor rub in a medicine cabinet or cupboard for 12 months. Enjoy!! I’ve seen salt and sugar scrubs in mason jars but not vapor rub. What a cool (pardon the pun) gift idea! I can’t wait to try this! Lol, nice pun ;). I have a “thing” for little mason jars and generally use them for just about everything. Enjoy!! Hi! So, I completely understand the decongestant aspect of eucalypse for MOST people. My family, are not those type of people. We have a reaction to the SMELL of eucalypse which cause worse nasal congestion and sinus headaches. I was recently sick and picked up for Vapor Rub without looking at the ingredients and after opening it and putting on my feet with socks got a bad headache. That’s when I found out about the eucalypse (it hasn’t been used in my family for years upon years and now I know why.) Is there a way that this can be made WITHOUT the eucalypse or melaleuca (which are essentially the same thing)? Unfortunately the eucalyptus is one of the key ingredients, so I’m not sure how effective the vapor rub will be if it’s replaced or removed. I use Rosalina from Plant Therapy in place of Eucalyptus to be safe around my kids. Works so well for nasal congestion! It’s Melaleuca Ericifolia, so not sure if it’s related to the Tea Tree Melaleuca, but it doesn’t smell like it at all. Very pleasant. I often mix with Fir Needle and Cypress (all three are kid safe). Wonderful, Trisha! Thank you for sharing! This is a cool idea. Can this be made with an alternative to beeswax? If so is it the same amount? Candelilla or soy wax perhaps? Hey Jess M M, I haven’t tried using another product as a beeswax substitute. I know people have commented about their success with candelilla. Let me know if you try it! I find it strange that Vick’s itself is marketed as a “children’s cough cold product appropriate for ages two and up” and does contain eucalyptus oil. Yet this natural version with no harmful chemicals like petroleum or turpentine is recommended only for kids over 10 because it contains eucalyptus oil. I have a feeling that warning is mainly intended for the full strength essential oil and not the 1% dilution used in vapor rub. Hey Danielle, I’ve always found that interesting–I don’t think essential oils are used in the commercial formula. When using pure essential oils at home, it’s best to use caution, particularly around children. While many kids are okay with eucalyptus essential oil, some may have a reaction. Hi. I’ve just found this on Pinterest It is similar to the blend I make for my grandchildren, but I left out the rosemary when they were small, as they had febrile convulsions. (Rosemary essential oil should never be used for any one with convulsive conditions) It still worked very well. I haven’t used coconut oil before but I will certainly give it a try. Hey Loraine, Wonderful info–thank you for commenting about the rosemary! I’m so glad you’re enjoying Live Simply! Very interesting, Julie! Thank you for sharing! Hello…I made this vapor rub today and it turned out great. My only question is…I thought it would have a more stronger scent like a store bought vapor rub but I think I smell more hints of the cocoa butter than anything. I bought all of my ingredients from Mountain Rose Herbs so I know they are good quality and organic. Any suggestions? Hey Jennifer, The homemade version isn’t as strong as store-bought since the ingredients used are quite different. Essential oils aren’t as strong (when it comes to scent) as the ingredients companies use in store-bought vapor rub, but the homemade version should provide the same kind of relief. You could increase the essential oils just slightly for a stronger scent–mixing an extra few drops into the amount scooped out at the time of use. I made this recipe this weekend and it’s completely solid. Is it supposed to be supposed to be solid as a rock? Hey Gretchen, It shouldn’t be solid as a rock. Is the outside environment very cold right now? That may cause the coconut oil to harden. I would try running the container under some hot water, or even bringing the container in a hot shower and let the steam loosen the vapor rub. Wow I am super sick right now and luckily had all of the ingreidents at home from other DIY projects. This is such a fantastic recipe, I am loving this ! Thanks for posting. I’m so glad you were able to make the recipe, Lindsey! I hope you feel better soon! I am using vics vapor rub at this very moment for aching muscles and joints.When you see the salve it appears that it is made with petroleum jelly. I wonder if this can be replaced with the coconut oil that some are allergic to? I am not allergic but was just a thought for others that cannot use coconut. 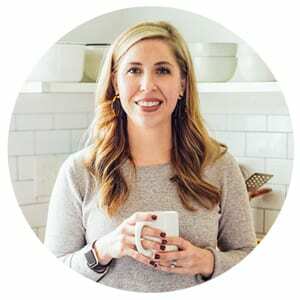 Hey Becca, Yes, I believe Vicks is made with petroleum jelly, which isn’t a very natural product, but I believe you can make an alternative at home:http://www.onegoodthingbyjillee.com/2012/04/make-your-own-petroleum-free-jelly.html. 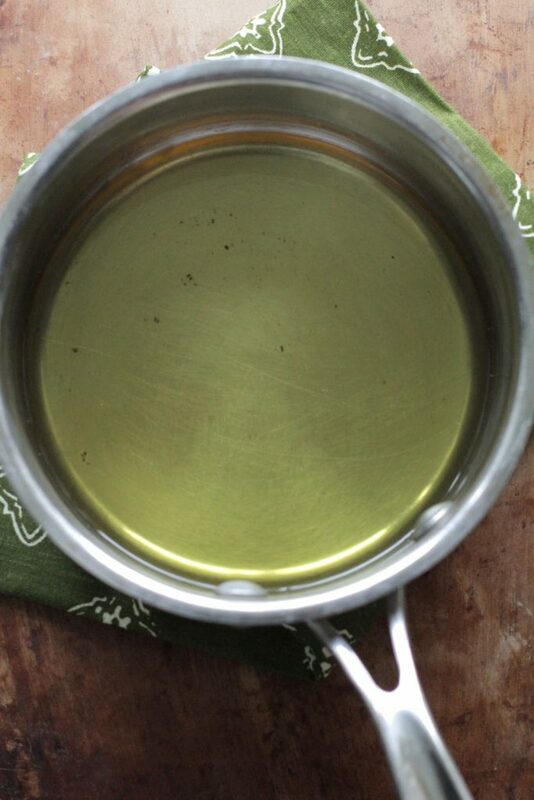 In this recipe, you could probably use a different oil instead of the coconut oil. From what I have studied it is recommended that essential oils be diluted for children under six years at 1% for therapeutic use and 2% for local medicinal use. Your recipe calls for 71 drops of essential oils, By my calculations only 63.75 drops of essential oils should be used at the most in this recipe for safety. I just wanted to point that out in case there were and oversight when typing the recipe. Note: This would not pose a problem for adults since 5% dilution is safe unless you are slathering it all over your body. Thank you for sharing! You can definitely reduce the essential oils if you’d like. Eucalyptus, peppermint, and rosemary aren’t considered kid-friendly essential oils (here’s a handy post that I refer to: http://www.thehippyhomemaker.com/essential-oil-safety-babies-children/), so it’s best not to use this on young kids. I just added the website link to the post, too, since it really should be in the post! I use the amounts called for in the recipe because the essential oils aren’t very strong at a weaker dilution (at least when we have a lot of congestion), and I’ve found the stronger concentration really helps us when we can’t smell anything. A little bit goes a long way, like Vicks, so we apply a small amount on our chests or our feet. One jar usually lasts about a year (or longer) in our home. Just Awesome Work Friend. Thanks For Such Nice Posts. I was just wondering about the volume your recipe yields. I want to ensure I have a big enough container once I have made a batch. Hayley, I haven’t made a batch in about 6 months (still have it :)), but from my memory, it makes one 4 ounce container. Eu faço com materiais como parafina que não é legal. A cera de abelha ou lanolina é muito melhor para saúde. Uso menthol e canfora, será que menthol e canfora também não são bons? estava pensando só em trocar a parafina, mas vejo que você só usa óleos essenciais. Hey Monica Da Cruz lapa Moreira, I don’t have any experience with the ingredients you mentioned. Sorry. Hello! Is there an expiration date for the vapor rub?. Thank you. Hey Pam, About a year :). hi Kristin! i’m hoping you can help me find any EO’s that may be safe and helpful for this to be used on a 3 yo instead of the ones in this recipe? admittedly, when i first starting using EO’s I didn’t know that I shouldn’t use these EO’s on younger children and I did. THANK GOODNESS he’s ok but I’m scouring the internet/pinterest to find something to help him w this awful cough and congestion. Just thought I’d see if you knew anything. thx! Hey Laura, I would try the Sniffle Stopper blend/synergy from Plant Therapy. It’s a blend from their kid-safe line. Then just add the recommended dilution amount (which looks like it is 3-5% dilution) to this recipe. I really want to try and make this but was curious as to the “thickness” of the final product. Do you think i would be able to put it in push up “deodorant ” style push up container? Ir is it too soft? Hmmmm, good question, Elizabeth. I was to say, yes, since it’s similar to a lip balm consistency. You could try adding a bit more beeswax to give it a firmer texture. Maybe another 1/2-1 tablespoon. Let me know if you try it! Hello, can i leave the cocoa butter? I cant find a shop selling it nearby. And I’ve heard that peppermint oil is good for stomach ache, lavender oil is good for insect bites and itchy skin and tea tree oil is good for cuts. So combining the 5 oils in your recipe, will the oils I mentioned still work for the ailments I mentioned? Or not. I used only coconut oil, eucalyptus oil, & peppermint oil, & it’s great! Will buy lavender oil later on. I like it also for chapped/dry skin! I don’t have cocoa butter what can I use as a substitute? Hey Laura, You could try shea butter. Hi Kristin, I have made this this afternoon. To tell the truth I’m disappointed. I had high hopes, it came together in a flesh – but it smells like chocolate. Don’t get me wrong I love chocolate, but I excepted something else with all those EOs in the ointment. True, I used high quality cocoa butter that has that distictive chocolate smell but with only 2tbs in it I expected the EOs to come through much stronger. Do you think I can still use it? Will it have the expected effect and help my son sleep with his stuffy nose? Hey Varga, I’m sorry to hear you’re disappointed. You don’t want an overwhelming EO scent. The EOs should do their job without being overwhelming. Cocoa butter does have a distinct scent, but shouldn’t overpower the EOs. Which brand of cocoa butter are you using? You could always add a couple of extra drops, if needed. How old is your son? As noted in the recipe, the EO’s used aren’t recommended for young children.